Lyndon Johnson once remarked that: "Being president is like being a jackass in a hailstorm. There's nothing to do but to stand there and take it." Abraham Lincoln's presidency epitomizes this sentiment. our appreciation that the words of his second inaugural address are etched in stone on the walls of his memorial in Washington, D.C. However, this present-day adulation was not widely held in 1861. Lincoln's physical attributes, including his extraordinary six-foot-four-inch height, large hands, over-sized ears, prominent nose and ungainly gait, provided easy targets for ridicule. His lack of formal education (he spent only one year in school) supplied his detractors the ammunition to attack his intelligence and deride his mental abilities. These negative attitudes subsided during the course of Lincoln's first administration. By the end of his first term he began to receive credit for his leadership during the nation's most troubling time. This reversal of attitude is reflected in the fact that he was elected to a second term - a feat that had not been accomplished by eight previous Presidents. His popularity was such that many newspapers predicted he would be elected for an unprecedented third term in 1868. 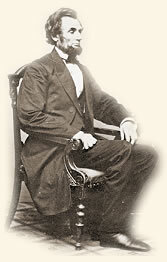 However, Lincoln had to suffer through a "hailstorm" of criticism through much of his first term. Soon afterwards there entered, with a shambling, loose, irregular, almost unsteady gait, a tall, lank, lean man, considerably over six feet in height, with stooping shoulders, long pendulous arms, terminating in hands of extraordinary dimensions, which, however, were far exceeded in proportion by his feet. He was dressed in an ill-fitting, wrinkled suit of black, which put one in mind of an undertaker's uniform at a funeral; round his neck a rope of black silk was knotted in a large bulb, with flying ends projecting beyond the collar of his coat; his turned-down shirt-collar disclosed a sinewy muscular yellow neck, and above that, nestling in a great black mass of hair, bristling and compact like a ruff of mourning pins, rose the strange quaint face and head, covered with its thatch of wild, republican hair, of President Lincoln. The impression produced by the size of his extremities, and by his flapping and wide projecting ears, may be removed by the appearance of kindliness, sagacity, and the awkward bonhomie of his face; the mouth is absolutely prodigious; the lips, straggling and extending almost from one line of black beard to the other, are only kept in order by two deep furrows from the nostril to the chin; the nose itself - a prominent organ - stands out from the face, with an inquiring, anxious air, as though it were sniffing for some good thing in the wind; the eyes dark, full, and deeply set, are penetrating, but full of an expression which almost amounts to tenderness; and above them projects the shaggy brow, running into the small hard frontal space, the development of which can scarcely be estimated accurately, owing to the irregular flocks of thick hair carelessly brushed across it. One would say that, although the mouth was made to enjoy a joke, it could also utter the severest sentence which the head could dictate, but that Mr. Lincoln would be ever more willing to temper justice with mercy, and to enjoy what he considers the amenities of life, than to take a harsh view of men's nature and of the world, and to estimate things in an ascetic or puritan spirit. A person who met Mr. Lincoln in the street would not take him to be what - according to the usages of European society - is called a 'gentleman;' and, indeed, since I came to the United States, I have heard more disparaging allusions made by Americans to him on that account than I could have expected among simple republicans, where all should be equals; but, at the same time, it would not be possible for the most indifferent observer to pass him in the street without notice. . . . In the conversation which occurred before dinner, I was amused to observe the manner in which Mr. Lincoln used the anecdotes for which he is famous. Where men bred in courts, accustomed to the world, or versed in diplomacy, would use some subterfuge, or would make a polite speech, or give a shrug of the shoulders as the means of getting out of an embarrassing position, Mr. Lincoln raises a laugh by some bold west-country anecdote, and moves off in the cloud of merriment produced by his joke. . . ."
of Antietam, Oct. 2, 1861. 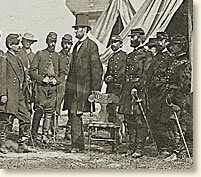 Seeing that General McClellan would be occupied, I walked out with my friend, who asked me when I got into the street why I stood up when that tall fellow came into the room. But for all that, there have been many more courtly presidents who, in a similar crisis, would have displayed less capacity, honesty, and plain dealing than Abraham Lincoln." William Russell's account appears in: Russell, William Howard, My Diary, North and South (Fletcher Pratt, ed) (1954, originally published in 1863); Kunhart, Phillip B., Jr., et. al., Lincoln: An Illustrated Biography (1992). "Views of President Lincoln, 1861" EyeWitness to History, www.eyewitnesstohistory.com (2005).